“After I left school for so many years, I could not do well in my translation work…I’ve been facing difficulties in my work, but I think that after I complete this course I will do better.” Simon was one of a dozen people who came to the Initial Skills course hoping to refine his language skills. Grammar, dictionary use, and pronunciation were some of the foundational lessons taught to the students in the class. In addition, the course helped them improve their ability to think critically, to do research, and to use the computer. They worked in groups to study a Bible passage from Luke, doing some research about the passage and developing a short Bible study for others to use. Next, they developed and recorded a radio drama based on their chosen Bible story. A few of the attendees were pastors who became better equipped to study and teach the Bible through the things they learned. As they completed the course they were better prepared to study scripture and to preach in English and in their own mother tongue. During the course Carol improved her typing skills and understanding of language to such a degree that she is now able to help Pastor Roy enter his translation work into the computer. Although she herself is not a translator, she is thankful she can now contribute in this way. 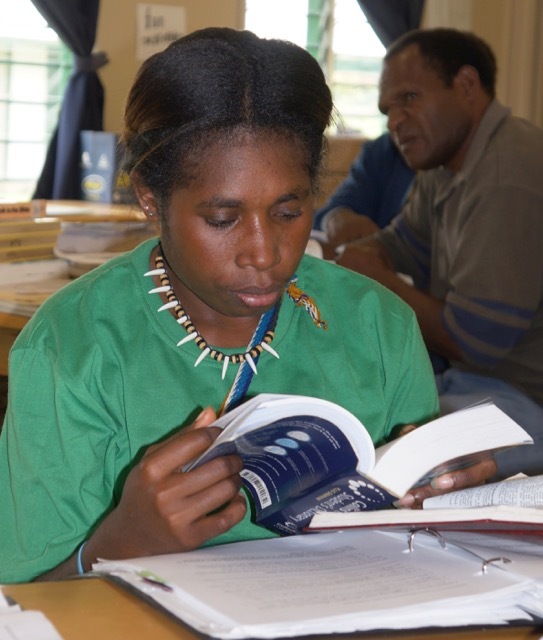 The majority of the men and women who attended were already involved in Bible translation, while a few of them were new members of translation teams. Attending the Initial Skills course helped them improve their capacity in their current work and become prepared to take more advanced translator training courses. When the best translation for a phrase isn’t clear to the translation team, sometimes a local language expert can help. 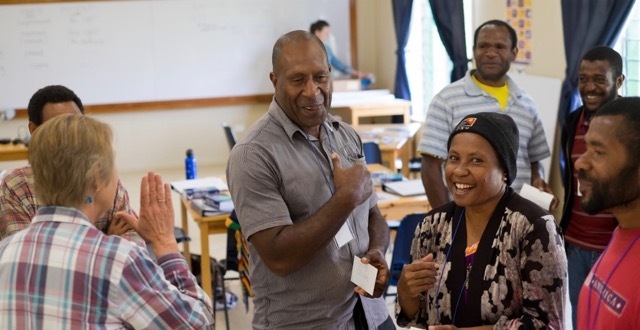 Indigenous speakers understand the language and the culture better than anyone and can suggest ways to make the verse communicate clearly to the hearts of the people. 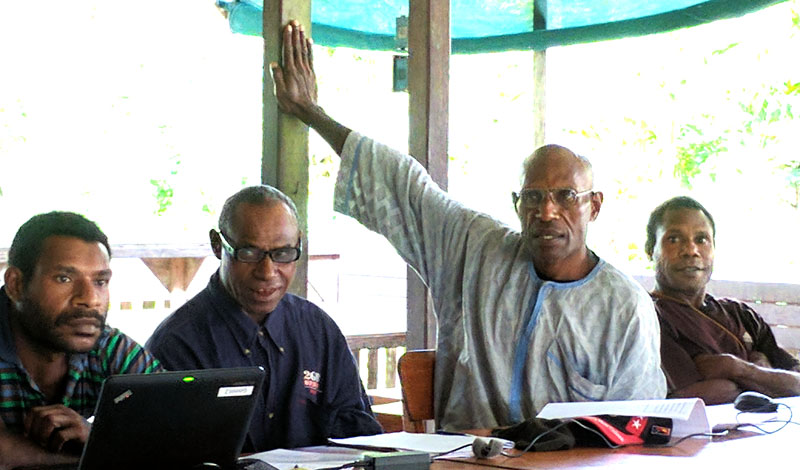 In the Sepik region of PNG, several people gathered to conduct the final checking on the books of I, II, and III John and Jude. They were challenged to find the best way to write the description of a believer’s intimate union with Christ. The writer of I John says we are “in Him.” That’s easy to express in English, but not in languages that only use “in” for things inside other things, but don’t use it in a metaphorical way. How would you express this concept without using the word “in”? Unsure how to translate this, the team asked Wolwale local language expert Philip Musi for advice. Philip explained while demonstrating by putting his hand firmly to a nearby post, “It’s like a lizard who has really stuck himself to a tree.” Everyone in the room knew exactly what that looked like. Now the revised draft of 1 John 2:28a in the Onnele Wolwale language reads: Kongkom uporo kinini, pone samo pangkana ka samo paipe fori uporo plau God. A rough English back translation is: My good children, you-all really stick to and really remain good friends with God. 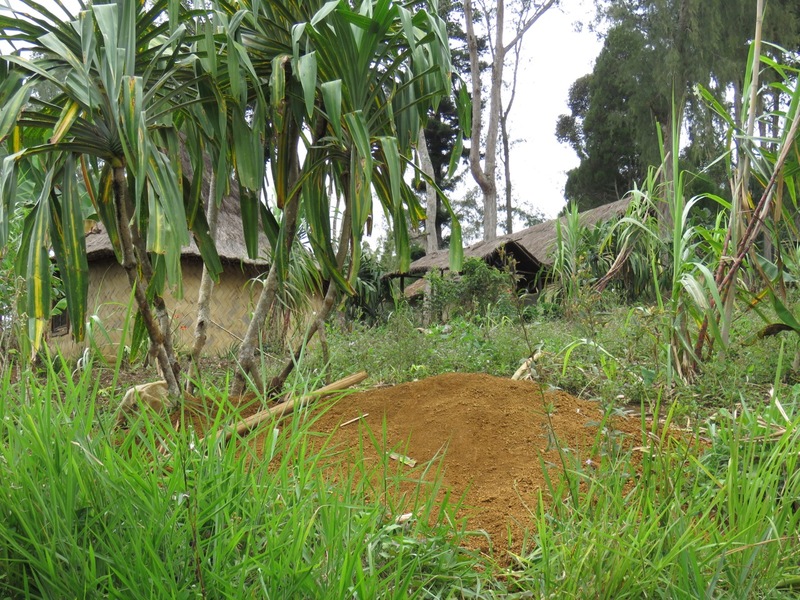 Pray for the Onnele Wolwale translators and others like them to remain “really stuck to God” as they continue translating his Word. In the past four weeks, Jonathan Wilson had spent a total of twelve mornings standing at the Nindewari marketplace trying to sell Binandere Scripture books. In all that time he had only sold six books. Jonathan was disappointed because he longed for these people to have God’s word, to read it, and to cherish it. Now he and his wife Kathy were planning to visit two Binandere villages upstream on the Gira River. Should he try to sell books there? Reluctantly he put the latest Binandere Scripture books in his backpack and carefully crossed the narrow log bridge, heading toward Kadeu village. The books he carried were a compilation of Mark, Luke, and Acts. When he arrived at the first village, Jonathan had the opportunity to read the story of the Pharisee and the Tax Collector (Luke 18:9-14) out loud to several men who were gathered on a porch playing cards. Drawn to the words, two of the men quietly arose and began peering over his shoulder to see this book written in their language. As soon as Jonathan finished the story, one of the men announced, “I want to buy one of those books.” Just that morning the man had walked 13 miles to visit his relatives in this house and was happy to be there when Jonathan came. One by one, the Scripture books were purchased by the Binanderes. 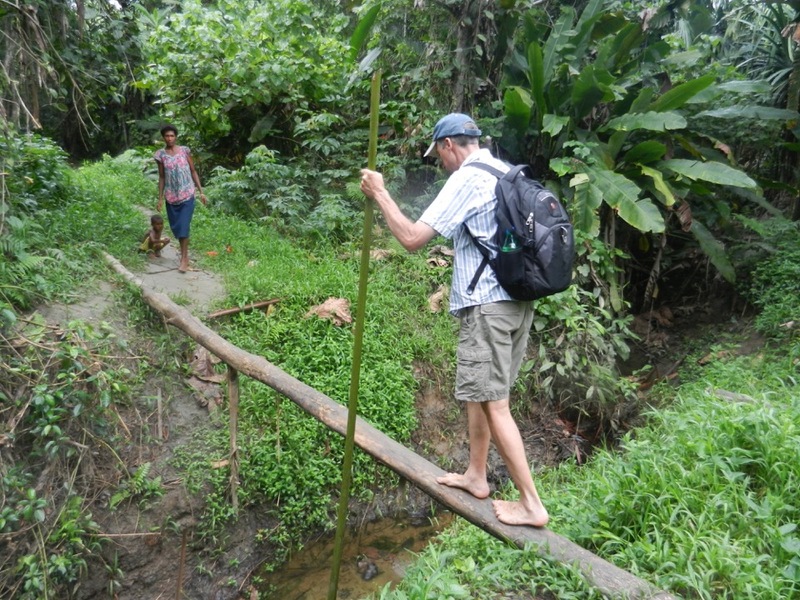 As Jonathan crossed back over the narrow log bridge in the afternoon, his backpack was much lighter. All the books he had carried that morning were now in the hands of Binandere men and women. No longer would they need to peer over someone else’s shoulder to see the book, or ask a visitor to read God’s Word to them. Now they could read the Binandere Scriptures for themselves. 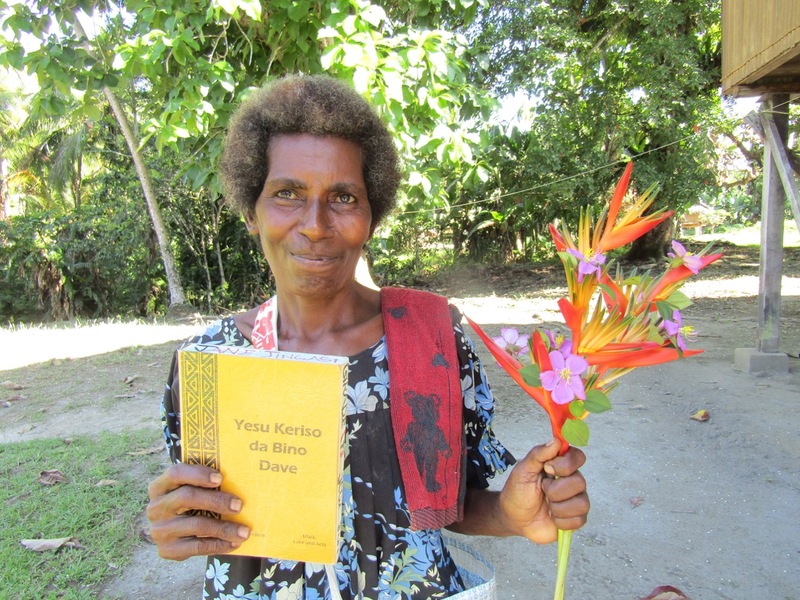 It was the early 1980’s and Des and Jenny Oatridge had been living among the Binumarien people for more than two decades, translating the Bible into their language. God’s Word was changing lives, sometimes in ways that took even Des and Jenny by surprise. One of those times came when the Oatridge’s long-time neighbor, Peetai, died. That evening Des went to sleep in his village house, expecting to be awakened before too long by the traditional mourning and wailing. Strangely, only quiet penetrated the night air. The next day Des accompanied the family to the graveside, but he was puzzled that no one in the village was plastered in mud, as tradition demanded.